Charity events are known as an epicenter of joy and selflessness. While the number of donations raised is the only obvious differences, the memories made by these events and the support given are all mirrored from past fundraisers. Whether you’re seeking a relaxing yet entertaining way to spend your day, or just looking for a place to hang out, we’ve got the event for you! Our next fundraising campaign will be hosted by Sierra aka MissSunshyne, on Friday, April 5th starting at 10 am and finishing at 10 pm! Did you know that fundraising events are evolving with new technology? If you aren’t an avid gamer or a casual member of an online community, you may not be familiar with the online streaming service known as Twitch.tv. The website is formally known as ‘Justin.tv’ decided to stick to gaming content, as they witnessed most of their live streamers were in fact, playing video games. Streamers and viewers are able to interact with each other (through a twitch provided chatroom) while playing some of their favorite games! When a streamer rises themselves through the ranks, gaining their own specific fan-base, the options of entertainment are almost limitless. Here, streamers can find their niche to really build a following that understands them as a person, and also as a gamer. We met Sierra earlier this year and could instantly feel her vibrant charm. The 25-year-old full-time streamer from Melbourne, FL started streaming back in September 2017. We conversed with Sierra over her twitch history, and says she “started [streaming] for fun, and it eventually turned into a full-time job”. Sierra continues, “I have a background in marketing and graphic design”, and “I really enjoy working with people”. This came as no surprise. Sierra’s energy, humble atmosphere, and personal interactions are all second to none. When you typically enter Sierra’s chatroom with a ‘Hello’, she almost instantly acknowledges you and makes you feel welcome. “Streaming is a really good way to use a lot of my talents, and it’s been a great experience!” She even has a movie viewing experience with her subscribers, one Sunday a month. Now that’s valuing your community! Have you ever been stuck at home with no possible way to explore the land around you? Unable to experience a new setting due to the lack of immediate funds? These thoughts are a reality for Anita Rutland, who was diagnosed at 38 with the rare disease called Porphyria, that left her in a wheelchair. As a former Emergency Medical Technician, she is now in need of your support! We are hoping to make a big dent into Anita’s fundraiser with your help! All of your donations will be going towards a wheelchair accessible vehicle, so she can finally get out of the house and live her life again. What we have planned for the Stream! A typical Twitch stream definitely does not run over 6-8 hours. Sierra will be putting 12 uninterrupted hours into this charity stream! This will only be her second 12 hour stream, as well as her very first stream dedicated to charity. This brings her quite the excitement. We are in high hopes to raise at least $1,250 for Anita Rutland! Over the 12 hours, she plans on streaming the game Counter-Strike: Global Offensive (Rated M for Mature). We also plan to have a few donation goal incentives, such as pieing her husband in the face! That’s not even all of it. Sierra also regularly hosts a cooking segment on her stream! When coordinating for this event, Sierra went out of her way to ask what Anita’s favorite dish was, so she could make it LIVE on stream. A gesture we did not expect! 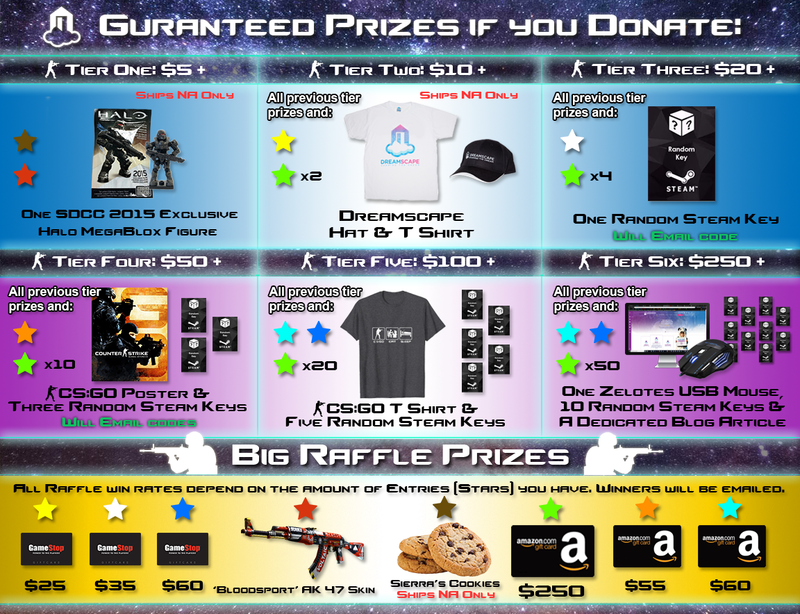 Giveaways are a standard for charity events on Twitch. Dreamscape Foundation’s fundraiser is no different. We plan to giveaway CS:GO and Dreamscape merchandise, random steam keys, and even a $250 Amazon Gift Card! (Depending on your donation tier) MissSunshyne also plans to host her own giveaways, one of a Counter-Strike: Global Offensive Gun Skin (AK47 – ‘Bloodsport’ Skin) and one of her home-baked cookies! (Only ships to North America) All one needs to do to enter, is to donate to Anita’s cause during the stream and we will work out the rest! We so look forward to all the fun happenings April 5th, 10am-10pm EST, and we hope you are too. We look forward to seeing you there!